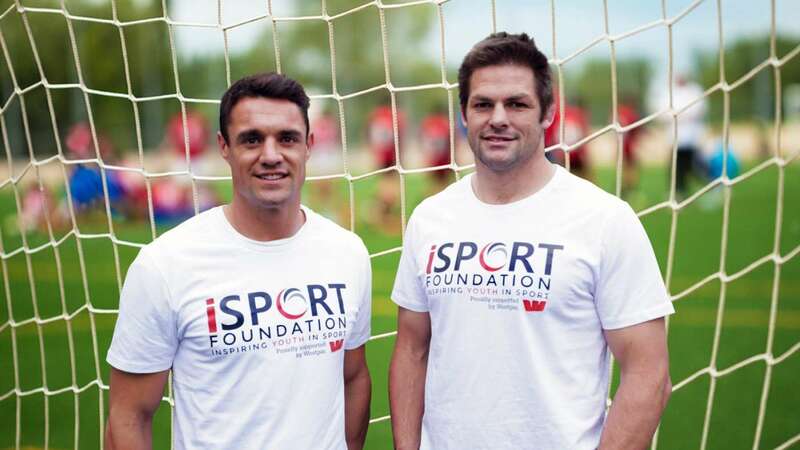 In 2009, three really cool guys, Richie McCaw, Dan Carter and Ali Williams launched the FOR EVERYONE CHARITABLE FOUNDATION (now iSPORT FOUNDATION). The trio frequently traveled around NZ with their odd-shaped ball and saw that many communities were struggling to raise funds for relatively small projects – like fixing a playground or changing shed, resurfacing a school pool or a BMX track, or simply adding hoops to the basketball court – which would make a huge difference to its members, encourage active participation, and raise community spirit. They set up the Foundation so that they could provide a helping hand to these groups, who were doing great work in New Zealand neighborhoods. Carter is regarded as one of the world’s best current first-fives and is believed by many to be one of rugby’s greatest fly-halves ever. Carter made his provincial debut for Canterbury in 2002 and joined the Crusaders the following season. He also made his All Blacks debut in 2003, scoring 20 points against Wales in Hamilton and going on to make the 2003 Rugby World Cup squad. He also played in the 2007 and 2011 Rugby World Cups, although a groin injury kept him out of the 2011 RWC playoffs and saw him miss the early stages of the 2012 Super Rugby season. He earned his 100th Super Rugby cap for the Crusaders against the Hurricanes in 2012 and in 2013 became the first Super Rugby player to exceed 1500 points. He has also played 100 test matches for the All Blacks. Dan was born in March 1982 in Southbridge, a small town in the South Island of New Zealand. From the age of 5, he played with Southbridge Rugby Club as a half back (scrum half). He attended Ellesmere College, and then Christchurch Boys High School. As a master of the breakdown and one of the coolest heads in the game, Richie is considered by many as the greatest openside flanker of all time. He debuted for the Crusaders in 2001 and was also selected for the All Black’s end-of-year tour that year despite having only played a total of eight minutes of Super Rugby. He quickly became the first choice openside flanker and was first named All Black captain in 2004 at just 23 years of age. In 2012 he became the first player to achieve 100 test victories. He also has the best success rate of any All Black and has been named IRB Player of the Year a record three times. Richie captained Canterbury to the national provincial title in 2004 and then led the Crusaders in back to back titles in 2005 and 2006 and again in 2008. Richie was born in 1980 in Oamaru. He played for the local Kurow rugby club as a youngster, but it wasn’t until 1994 at Otago Boys’ High that he started to take the game seriously.